In what may be an inevitability, Christmas has once again snuck up on me. It seems like just yesterday I was making pies for Thanksgiving. And now, there are only two weekends until the big day. If, like me, you've only dabbled in your gift-buying, now is the perfect time to start going at it in earnest. To avoid the chaos that comes with shopping truly at the last minute, you've got to get out this weekend! Where: Maplewood Elementary, E. 38 1/2 St. & Maplewood Ave.
We'll be at this festive event with a large selection of our most popular gifts! There will be music, free hot cocoa, and plenty of amazing makers to check out. This event also supports the Chula League and their local art programs, so you'll be shopping for a good cause. We curated a gift guide for the latest issue of Citygram, which was released yesterday. (Download it now through the Citygram app!) 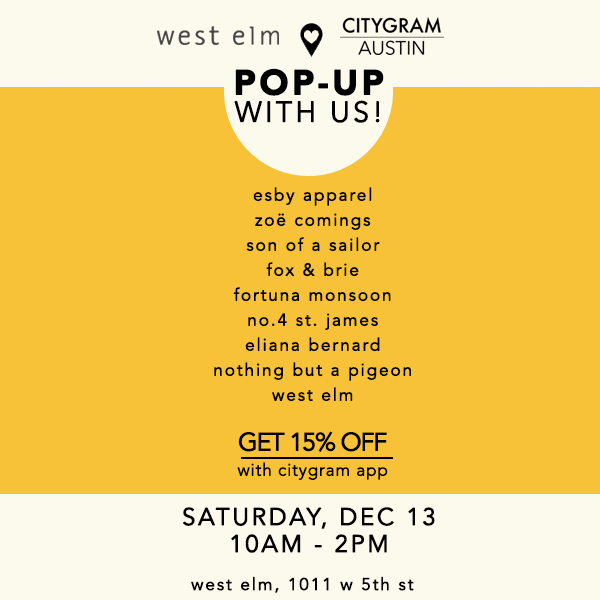 Citygram has invited a great selection of our included makers to set up shop in West Elm on Saturday, which will no doubt result in a high concentration of awesome stuff. As an added bonus, you can get 15% off any purchase when you show us your Citygram app. We'll be there from 10 AM to 2 PM! When: Every day from 10 AM to 10 PM, until Dec. 24. Where: Marchesa Hall, 6226 Middle Fiskville Rd. The variety at this craft show is just amazing. With over 200 artists, and thousands of items, you'll be able to find something for everyone on your list. We won't be here in person, but you can find our display in the leftmost room! In addition to our normal retail hours (M-F 10 AM to 6 PM), we'll be open this Saturday from noon to 6 PM! Come shop in our studio, and see where the magic happens.